01:20 23:55 06:55 07:55 空中交通控制中心確認與航班失去聯繫. ^ 1.0 1.1 1.2 Flightradar24 on Twitter. Twitter. [2014-12-28] （英语）. ^ AirAsia flight from Indonesia to Singapore missing. BBC Online. [2014-12-28] （英语）. ^ 5.0 5.1 5.2 亞洲航空8501 最後通訊曝光. 法新社. 2014-12-30 （中文（香港）‎）. ^ 快讯：亚洲航空一架客机失联. 网易. 中国新闻网. 2014-12-28 [2014-12-28] （中文（简体）‎）. ^ 廉航亞洲航空班機　印尼飛往新加坡失聯. 雅虎. 雅虎新聞. 2014-12-28 [2014-12-28]. （原始内容存档于2014-12-28） （中文（繁體）‎）. ^ 8.0 8.1 8.2 機長曾兩度要求改航道. 星島日報. 2014-12-30 （中文（香港）‎）. ^ 亞航稱失聯客機機長以天氣惡劣要求更改航道. 香港電台. 2014-12-28 [2014-12-29] （中文（香港）‎）. ^ AirAsia Flight 8501:Preliminary meteorological analysis - Weather Graphics. Weather Graphics. [2014-12-28] （英语）. ^ AirAsia (Indonesia) Flight QZ8501 Incident. Transportmalaysia. [2014-12-28]. （原始内容存档于2014-12-28） （英语）. ^ Tweet. Twitter. Kementerian Perhubungan Republik Indonesia (Indonesia Transport Ministry). 2014-12-28 [2014-12-29] （印度尼西亚语）. 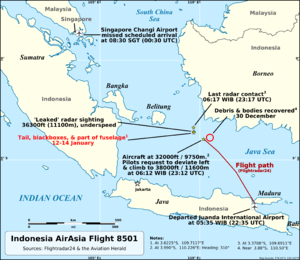 ^ AirAsia 8501 Missing: Timeline of Events. ABC News. 2014-12-28 [2014-12-29] （英语）. ^ 14.0 14.1 Sentana, I Made; Raghuvanshi, Gaurav. Search for Missing AirAsia Flight 8501 Resumes. Wall Street Journal. 2014-12-29 [2014-12-29] （英语）. ^ 15.0 15.1 15.2 15.3 亞航客機失蹤 162人恐罹難. 太陽報. 2014-12-29 [2014-12-29]. （原始内容存档于2014-12-29） （中文（香港）‎）. ^ Leung, Nancy. Missing AirAsia Flight QZ8501: At a glance. CNN. 2014-12-29 [2014-12-29] （英语）. ^ Bengali, Shashank. AirAsia Flight 8501 probably 'at bottom of sea,' official says. Los Angeles Times. 2014-12-28 [2014-12-29] （英语）. ^ QZ8501 flight path not safe, says aviation expert. The Malaysian Insider. Edge Insider Sdn Bhd. 2014-12-30 [2015-01-05]. （原始内容存档于2015-01-06） （英语）. ^ AirAsia jet with 162 on board goes missing on way to Singapore. CNN International Edition. 2014-12-28 [2014-12-28] （英语）. ^ AirAsia flight from Indonesia to Singapore loses contact. The Sydney Morning Herald. 2014-12-29 [2014-12-30]. ^ [Updated statement] QZ8501. AirAsia Facebook page. 2014-12-28 （英语）. ^ 22.0 22.1 22.2 葉靖斯. 亞航QZ8501：多國恢復搜索失聯客機. BBC中文網. 2014-12-29 [2014-12-30] （中文（繁體）‎）. ^ 失聯亞航法籍副機師 自小夢想飛行. 中央社. 2014-12-19 [2015-01-01]. ^ 亞航失聯 入境處確認機上1人為香港居民. 香港蘋果日報. 2014-12-29 （中文（香港）‎）. ^ [Updated statement] QZ8501 (as at 10:35pm, GMT+7). AirAsia Facebook 官方專頁. 2014-12-28 [2015-01-19]. （原始内容存档于2015-01-10） （英语）. ^ 亚洲航空印尼泗水飞新加坡客机失联. BBC中文網. 2014-12-28 [2014-12-28]. ^ Air Asia updated statemen （英语）. ^ [Updated statement] QZ8501 (as at 6:54pm, GMT+8). AirAsia Facebook. 2014-12-28 [2014-12-28]. ^ 外媒：23人预订失联亚航航班机票但未登机. 中國新聞網. 2014-12-28 [2014-12-28]. ^ 32.0 32.1 周旭. 马来部署一C130运输机与三艘船舰搜寻失联航班. 环球网. 2014-12-28 [2014-12-28] （中文（简体）‎）. ^ 亞航客機失聯空中搜索行動暫停海上搜尋繼續. 商業電台. 2014-12-28 （中文（香港）‎）. ^ Search called off for day 1 due to darkness and bad weather. Asian Correspondent. 2014-12-29. （原始内容存档于2014-12-28） （英语）. ^ 多國今早恢復搜索失蹤亞洲航空客機. 商業電台. 2014-12-29 （中文（香港）‎）. ^ 印尼海军已赶往失联海域搜寻. 搜狐. [2014-12-28] （中文（简体）‎）. ^ AirAsia flight QZ8501 loses contact with air traffic control. 路透社. 2014-12-28 [2014-12-28] （英语）. ^ AirAsia Indonesia Flight QZ8501. 2014-12-29. （原始内容存档于2014-12-29） （英语）. ^ 40.0 40.1 多國恢復搜索失蹤亞航恐沉海底. 星島日報. 2014-12-29 （中文（香港）‎）. ^ 澳洲加入搜尋亞航失聯班機. 法新社. 2014-12-29 （中文（香港）‎）. ^ 印尼向美國尋求協助搜索失蹤亞航客機. 商業電台. 2014-12-30 （中文（繁體）‎）. ^ AirAsia search: Day 2 (This page automatically updates). BBC. 2014-12-29 （英语）. Steve Herman, Asia Correspondent, Voice of America, tweets: U.S. Navy says "assets in 7th Fleet stand ready to assist in any way that's helpful." ^ 美海軍第七艦隊出動驅逐艦搜尋亞航失聯航班. 人民網. 2014-12-30 [2014-12-30]. ^ Wilda Asmarini/ Adriana Nina Kusuma. 救援人员在印尼海域打捞亚航失联客机残骸及遇难者遗体. 路透雅加達. 2014-12-30 （中文（中国大陆）‎）. ^ 亞航客機遇難 尋獲遺體3具. 中央社. 2014-12-30 [2014-12-30] （中文（繁體）‎）. ^ AirAsia Flight QZ8501: Indonesia search chief says 3 bodies retrieved in hunt, not 40. AFP, AsiaOne（英语：AsiaOne）. 2014-12-30 （英语）. ^ 印尼當局偵測到疑似亞航客機殘骸. 香港電台. 2014-12-31 [2014-12-31] （中文（繁體）‎）. ^ 印尼涉事航空官員 停職查辦. 經濟日報. 2015-01-06. （原始内容存档于2016-03-05） （中文（繁體）‎）. ^ 墜毀亞航搜索範圍稍微向東移. 商業電台. 2015-01-06 （中文（繁體）‎）. ^ 53.0 53.1 Live blog: AirAsia flight QZ8501 crash. Channel NewsAsia. 2015-01-09 [2015-01-09]. （原始内容存档于2015-01-09） （英语）. ^ AirAsia Plane's Tail May Be Lifted to Retrieve Black Boxes. The New York Times. Associated Press. 2015-01-08 [2015-01-08] （英语）. ^ Police Identify Eight More Victims. The Jakarta Post. 2015-01-07 [2015-01-07] （英语）. ^ FDR dan CVR QZ8501 Selesai Diunduh. KEMENTERIAN PERHUBUNGAN REPUBLIK INDONESIA. 2015-01-15 [2015-01-17] （印度尼西亚语）. ^ Searchers recover one black box from AirAsia Flight QZ8501, find the other. CNN. 2015-01-12 [2015-01-12]. ^ ICAO Notification and Reporting Checklist (PDF). International Civil Aviation Organization. 2011-07-25 [2015-01-18]. （原始内容存档 (PDF)于2015-01-18） （英语）. ^ AirAsia’s cockpit recording downloaded. The Jakarta Post. 2015-01-16 [2015-01-18]. ^ AirAsia jet's alarms 'screaming' at crash. The Sydney Morning Herald. AFP. 2015-01-21 [2015-01-21] （英语）. ^ 61.0 61.1 AirAsia Plane Often Experiences Trouble, Former Pilot Says. Tempo. 2015-01-25 [2015-01-25] （英语）. ^ 亚航客机失事可能祸起机长“反常”操作. 新华网. 新华社. 2015-02-01 [2015-03-26] （中文（简体）‎）.